Product prices and availability are accurate as of 2019-02-04 07:51:57 UTC and are subject to change. Any price and availability information displayed on http://www.amazon.com/ at the time of purchase will apply to the purchase of this product. Our SignoCast Pearl line of cookware is formed from vacuum - pressure cast aluminum and is guaranteed never to warp. New stain free pearl ceramic coating. SignoCast Pearl is exceptionally easy to clean and facilitates fat - free cooking. The ergonomically designed phenolic handles facilitate safe and easy transporting. European design and styling. Ergonomically designed Phenolic handle. Vacuum cast aluminum body is energy efficient will not warp heats evenly and quickly. Stain - Free Pearl Ceramic Coating, tested in the toughest Italian Kitchens for over 18 months. Beautiful coating is perfect for serving, too. Can go straight from stove or over to the table. Tempered Glass Lids with Stainless Steel Rim and Cool To The Touch Knob and Finger Guard (glass 4mm thick). Easy Clean-up. Dishwasher Safe. 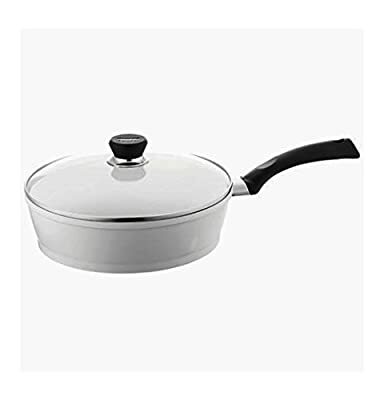 Oven-safe to 350 Degree F.
Size: 11.5 inch. Capacity: 4 quart.